Canada have likely done enough to avoid relegation this year but at their current playing level, it introduces doubts about next year. Is the program maintaining the status quo or slowly falling behind? The team defeated Japan to avoid another last place finish which was the good news, it put Japan back in relegation jeopardy at 22 points. Wales who finished equal to Canada in an 11th/12th tie now have 25 points and Kenya who won the 13th place playoff (Shield) have 26 points. The last two tournaments will mean series life or death for these three teams, one will get relegated with Ireland eager to take their place. Ireland who have had the better of Canada in their meetings will make the series more competitive next year, Canada will have to improve to survive. It's interesting and says a lot about the program that after shaking up the roster to get the big upset over Scotland, coach McGrath went back to his more traditional roster for the important Japan match. 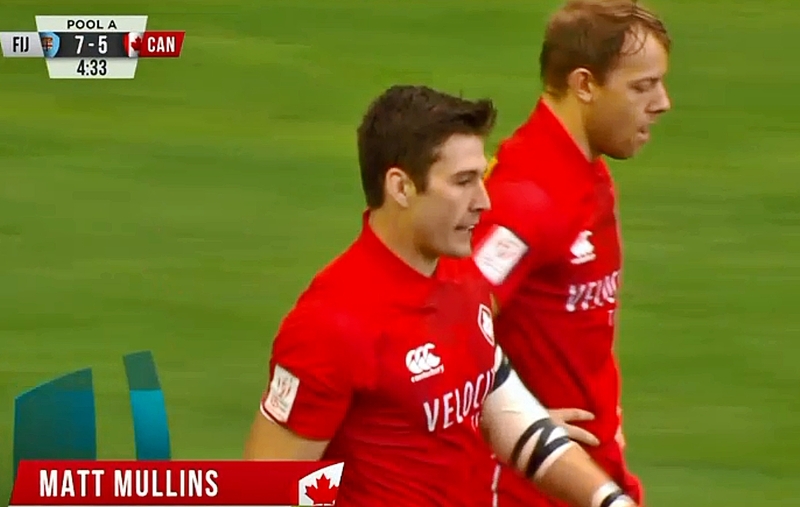 Canada pulled away and won it in the second half with all subs making an appearance. Coach McGrath is known as a player's coach and is loyal to his senior players, that's a double edged sword as it builds trust and cohesion but makes it difficult to introduce significant changes. In the France match both teams were tired and making mental errors, Canada made quite a few more and that was the difference. The game was there for the taking but accurate decision making had gone out the window as fatigue took over. The bench didn't get the job done as fresh legs didn't equate to improved performance and that one required impact player didn't put their hand up. Harry Jones was in civvies for this match, and David Richard was the 12th man. In retrospect this might have been the time to give him a few minutes as the three subs that did come on failed to deliver anything special. France in comparison used their full bench. Canada currently sit 12th at 41 points and actually gained ground on Spain in 11th with 47 points. If Canada finish strong they could claim 11th. They also could fall down the rankings if Kenya, Wales or Japan make the Cup round in the remaining two tournaments. Kenya with the return of their experienced players and athletic ability could possibly reach that goal depending on the London pool selections. Standout players at Singapore - Connor Braid is a workhorse but was out on his feet by the time the France match came along, yet he was the one running down the French runner from behind on a sure try with a minute left in the match. Matt Mullins, the new John Moonlight perhaps, Canada's closest thing to Danny Barrett the effective USA tough guy. His hands need to soften up a bit as he can drop some clunkers. Phil Berna lots of potential but decision making fails him sometimes, that basketball pass in the France match that went into touch, ouch. Jake Thiel improving every tournament, starting to believe in himself which is important. Luke McCloskey, another player who needs self belief, when he backs himself he's scored some nice tries but has been in the shadows a long time and needs to show more when he's given the chance. Nate Hirayama, the leader of the group, always central to the attack but looking a little tired at the end of the season - should he be rested for London and Paris to rejuvenate for important July Olympic qualifier? Harry Jones, works hard and always hustling, didn't dress for France match so perhaps another candidate for rest at London and Paris. Mike Fuailefau, has moments of attacking brilliance, but you're not going to build a high-tempo, aggressive defensive platform around him, perhaps best suited to impact sub now. Justin Douglas, not quite back to top playing form after returning from injury. Admir Cejvanovic and Isaac Kaay, both fit in the Luke Bradley mold, all three were excellent loose forwards in XVs prior to turning to 7s. They slimmed down but haven't quite made their mark in 7s. Bradley now is a centre in XVs and doing well in that position, will he get a shot at the national team or a pro contract - time will tell. Isaac Kaay played wing in XVs last summer at the provincial level. Andrew Coe hasn't quite found his way yet at this level in 7s, another player with excellent XVs potential. The key missing players, Cole Davis probably top of the bunch, made a huge impact and took some of the load off Braid. Pat Kay, can be hot or cold, some decision making frailties but would be a starter if Hirayma rested for London/Paris. Adam Zaruba, big unit, but hasn't returned to full 7s form after the stint with the NFL. Then there's the up and comers who want a shot, David Richard is one of several - Brock Webster, Quinn Ngawati, etc. Do you take a chance in London/Paris with some of them and build depth for the future or stick with the status quo and try to improve from 12th to 11th. The relegation threat seems low with only two tournaments left and three teams playing at Challenge level below you. London is 40 days away, plenty of time for coach Damian McGrath, and the senior players, to plan their strategy leading up to July with a long term view of next season. There were no surprises for Canada in their opening two matches as they were put to the sword by Fiji 50-12 and then South Africa 36-0. The results were predictable but watching the Fiji game was still cringe-worthy. Had the nutritionist taken the Canadian team off red meat and was feeding them bean curds infused with relaxing chamomile? Had the S&C coach forsaken lifting weights for a regimen of yoga stretching and tantric hugging? Something was amiss with the team energy and culture. Starters in the Fiji match were Mike Fuailefau, Harry Jones, Isaac Kaay, Connor Braid, Justin Douglas, Nathan Hirayama, Luke McCloskey. For the South Africa match Admir Cejvanovic replaced McCloskey but the result didn't change. The pleasant surprise is that Canada defeated Scotland in the 3rd match 33-10. Coach McGrath shook up the lineup for that match starting Jake Thiel, Phil Berna and Matt Mullins and benching Nathan Hirayama, Isaac Kaay, Luke McCloskey and Admir Cejvanovic. We haven't reviewed the video yet but Jake Thiel scored two tries, Harry Jones one, Hirayama off the bench scored one and Phil Berna closed out the scoring. There may be hope. Canada now face Japan in the Challenge Cup QF, it's a must win because the other teams in Canada's draw are tougher than Japan, Kenya and France. If Canada don't defeat Japan to go up to the top level of the Challenge final, it's likely they'll end up with 1 point again at this tournament. The good news is that Kenya, Wales, Japan who are all chasing Canada ended up in the Challenge pool as well. Wales have the best chance of advancing to the Challenge semi-final as they drew Hong Kong. A win for Canada against Japan will make Canadian rugby fans breath a little easier as they'll add a little distance between themselves and the relegation position. Also positive news is USA made the Cup round again so get closer to confirming their top 4 finish and Olympic qualification, thereby opening up the field for Canada in the regional Olympic qualifier in July to be held in the Caymans.